This is a color composite image of Rhea (pronounced REE-ah) I made from raw images acquired by the Cassini spacecraft on March 9, 2013, during its most recent — and final — close pass of the moon. The visible-light colors of Rhea’s frozen surface have been oversaturated to make them more apparent… even so, it’s still a very monochromatic place. The primary purpose of this targeted flyby was to probe the internal structure of the moon by measuring the gravitational pull of Rhea against the spacecraft’s steady radio link to NASA’s Deep Space Network here on Earth. The results will help scientists understand whether the moon is homogeneous all the way through or whether it has differentiated into layers of core, mantle and crust. See another color image of Rhea here. Rhea is a very reflective world, indicating that it’s made up of a lot of water ice. It is also extremely cratered… in fact, it’s one of the most heavily-cratered worlds in the entire Solar System. Rhea is made up almost entirely of rock and water ice, which is as hard as rock at the low temperatures (280 to 360 degrees below zero F) found at that distance from the Sun. 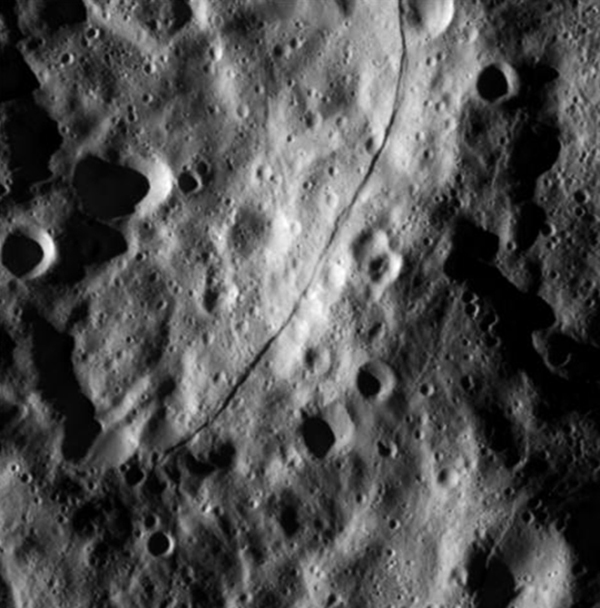 The rim of the 360-km (220-mile) -wide crater Tirawa can be seen crossing the terminator along Rhea’s northern limb.